The Vaquita Porpoise lives in just one place on earth, and there are fewer than 200 of these critically endangered marine mammals there. Meet a very special marine mammal - a porpoise we call Vaquita. 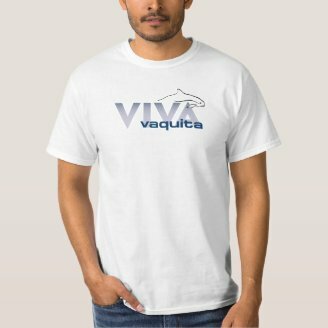 The Vaquita is not a dolphin. It's a porpoise, and a very special one, toos. What makes this porpoise species so special? They're special because they are so rare. They are, in fact, the world's most endangered marine mammal. People rarely see porpoises, since they, unlike dolphins, are not inclined to 'socialize' with humans. An additional reason that the Vaquita Porpoise is rarely seen is that it lives in just one spot on earth, and there are very few of them there. Indeed, scientists estimate the total population of this species is around 200. Yes, just two hundred - maybe even fewer! The Vaquita is actually a porpoise, rather than a dolphin, and is the world's most endangered sea mammal. Yes, they are mammals, as they breathe air and give birth to live young. As far as we know, they live in only one place on earth - in the warm waters of the northern Sea of Cortez, which is also known as the Gulf of California. The species was only discovered in 1958. Unlike dolphins, to whom they are related, they flee from, rather than approach boats, so they are harder to study, and there is still much to be learned about them. Scientists think there are at most perhaps 200 of them in the wild. 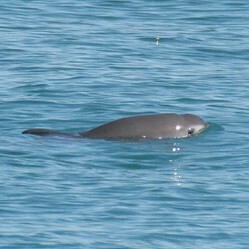 Vaquitas are smaller than other porpoise species. Fully grown, they measure around five feet long, and weigh only about 120 pounds. They don't seem to travel in the familiar pods, like dolphins. They've only been observed swimming alone, or with one or two other individuals. Notice the shape of the head of the following porpoise in the photo above. Generally,the shape of the head is one of the ways you can distinguish a porpoise from a dolphin. More differences are listed farther down on this page. To learn more about how you can adopt one of these rare marine mammals, or donate to the World Wildlife Fund, visit the WWF's pages about the Vaquita. T he seven species of porpoises, five have fins on their backs, and two do not. Those with dorsal fins include the Vaquita, Harbor, Spectacled, Dall's, and Burmeister's Porpoises. The two with no dorsals are the Indo-Pacific finless porpoise and the Narrow-ridged finless porpoise. Of the seven species, three have been assigned a Conservation Status. CRITICALLY ENDANGERED - Probably less than 200 left alive, making it the most endangered marine mammal on the planet. Not Endangered, but a number of threats to the current population are recognized. Listed as "LC," for Least Concern, the lowest rung on the 'concern' ladder. 1.2 million are remaining. Also listed as LC, estimates are that there are about 700,000 in the wild. Here's touching rare footage of a live baby Vaquito, who was separated from his mother. Humans tried to save him, and in this video, the story is told from the baby's point of view. It highlights the grave danger in which the species finds itself, and points out the main threat, as well as what is being done to help the porpoises survive. It's in Spanish, with English subtitles, and reminds me of the old phrase, "Out of the mouths of babes..."
You mean they're not the same thing??? I think I could probably tell them apart if I saw a dolphin and a porpoise side by side. I am very good at telling them apart! Thank you for answering! keep reading to learn some of their differences and similarities. It seems that some people are confused about the difference between dolphins and porpoises. A few even seen to think the the two terms both refer to a bunch of 'big fish.' They don't. There are major differences between the two. Neither is a fish. Both porpoises and dolphins are marine mammals. They can recognize their own reflections in a mirror. Also in common is their use of echolocation for navigation and communication, though dolphins seem to communicate that way to a greater degree. Below are some basic points to help you remember the differences. Learn a little bit about seahorses, as well as why a Seahorse theme is perfect for the bath, no matter what your favorite home decor color is. Why you should never use real ones. Bring some dolphins into your kitchen, not to cook but to enhance your decor. Learn why the mahi-mahi replaced 'dolphin' on many restaurant menus. Did you already know about the Vaquita Porpoise? CruiseReady, Is the Vaquita porpoise like the olinguito in that the species' existence comes as a surprise? 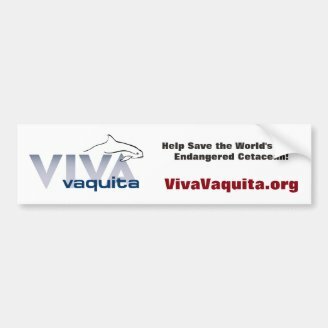 What seems to be the suspected future of Vaquitas, whose numbers now seem to be in the two, not three, digits according to online sources? I think that may be because we actually see a lot more of them They seem to relate really well to humans. You're so right. We hear much more about dolphins than we do about porpoises. Very nice article. Rock pools are amongst the most fascinating ecosystems in nature. Exploring them reveals the beauty and fragility of these miniature worlds.